Theremin World - Theremin Upstages Orchestras Across The United States! Theremin Upstages Orchestras Across The United States! So far 2009 has been seeing more theremins on concert stages. Maybe the need to draw audiences is making orchestras do more film music programs, and Miklós Rozsa's Spellbound Concerto for Theremin and Orchestra may not only bringing the theremin into the halls, but helping folks perceive it as more than a specialty instrument. In this music review New West Symphony goes to the movies they are not clear on the date of the concert, it might have been the January 23.24 one we posted here at TW. Chen's [ed. : Sean Chen is a 20-year-old pianist of remarkable ability] enthusiastic performance was nearly upstaged by the inclusion of the theremin, an early electronic instrument patented in 1928 that was used by Rózsa in the original score but is rarely performed in concert settings. This fascinating instrument, which made the left wing of the stage look like an antique furniture store, emits an eerie electric quaver that has been used frequently in film and television music. They do not mention the thereminist either, but I hope it was our own Charles Lester! I've heard his set up does indeed resemble a classy antique furniture store. Did any TW members catch this one? 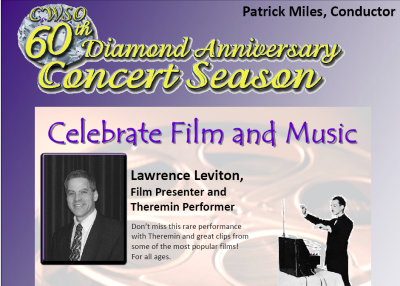 Coming up this week the Central Wisconsin Symphony Orchestra is featuring Lawrence Leviton on the "Eerie theremin". “The whole concept of moving your hands through space and manipulating sound is fascinating,” said theremin player Lawrence Leviton. Leviton is also a cello professor at the University of Wisconsin-Stevens Point, where he teachers a class in film music, which is why he learned how to play a theremin, a talent he will demonstrate Feb. 21-22 in two concerts celebrating film music with the Central Wisconsin Symphony Orchestra. Has the recent Theremin Renaissance finally brought us to seeing it considered a "respectable and accepted" concert instrument?